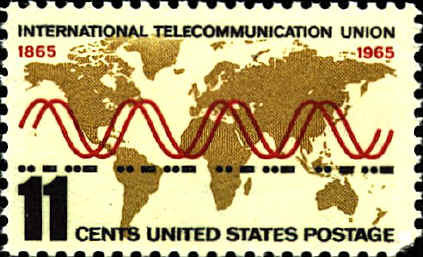 According to United States Postage Stamps: An illustrated description of all United States postage and special service stamps, published by the Office of Stamps of the United States Postal Service in 1974, the projection used on this stamp is the "Galt" projection. That is an error; there is no "Galt" projection. The projection used is the stereographic cylindrical projection published by Rev. James Gall in 1855 in the Scottish Geographical Magazine. It is neither conformal nor equal-area, but it produces less distortion of size than the Mercator Projection.